This is it. Labor Day. The end of summer. The calendar doesn’t know that. Officially, summer has three more weeks. The weather doesn’t know that. It’ll be 93 today. 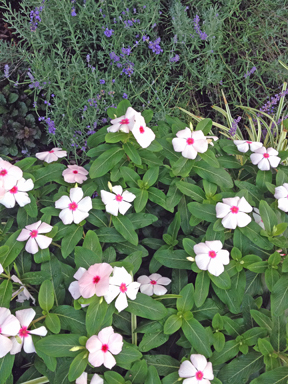 The pale pink, almost white, impatiens at the front of my house are in their heyday. I will plant this color again next year. I love pastels — the lighter the better. Whites, pinks, lavender. This is a girl house; it should be this way. But school has started, and so has football, and people have other interests than flowers, the grill, and the pool in September. By September, summer is overdone, overripe — a yawn. This year, I grew tired of summer in July. I don’t know if it was the way-too-hot Arizona vacation or not being able to sit on my deck because of the heat or not having the time or stamina to participate in any fun activities near home. I haven’t taken the kayak out at all this summer. I miss the peaceful water. I miss paddling, listening to riffles, and laughing. By Labor Day the trees are usually a faded light green with a hint of yellow here and there, like they are losing energy. But this year as I look out in the distance, the trees lining Aenon Creek are as deep green as May. The maples and tulip poplar in my yard are green from sun and a good rain. 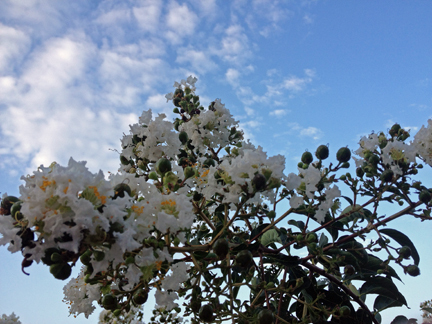 The crape myrtles are bursting with blooms. They always just keep on going to the end. And that’s the way it should be. Keep on blooming. Not like my tomatoes that dried up and wilted down and stopped producing. Not like my river birch that just gave up a month ago, now with only a hundred leaves left maybe. It needs more sustenance than it can draw from my hard-baked ground. I, too, have been gearing down for fall. I keep thinking that in two weeks, or three, we might have a cool spell. I think of cold nights, fires in the chimenea, a cold breeze on my face, fleece jackets, and going inside for winter. I even made a pot of vegetable soup yesterday. Who makes soup on Labor Day? I need to be like the pinks and purples and whites — embracing summer till the last — denying that fall is before me and the cold will come and the flowers will fade. There’s still life in September, and my life is a picture of that. I’m a September baby. I took my first breath the day before Labor Day that long-ago year. I should be gearing up, rather than winding down. I should be laughing. I should be looking up into the heavens and thanking God for every breath.